We set high standards and bring exceptional quality to all areas of women’s healthcare, research and education. We are honest and ethical in every situation, especially when it is not easy. We offer novel, creative ideas and pioneer discoveries that advance women’s healthcare. We value, respect, and engage our differences, enhancing our ability to make discoveries, educate tomorrow’s leaders, and deliver extraordinary care to our diverse patient population. We work together to achieve shared goals over personal goals. We believe the best results come from integrating a mix of perspectives, talents, and experiences. We are never satisfied with the status quo; we all seek improvement in every aspect of delivering, researching and supporting women’s healthcare. We are in tune with and engage our community to make our care accessible for all who need women’s health services. We advocate for better health for the women in our community and around the world. It is with great pleasure that we welcome you to Duke! The Department has a long history of excellence and leadership in gynecologic oncology. The division was founded in the early 1970s by Dr. William Creasman and then led into the 21st century by Dr. Daniel Clarke-Pearson. We have had a fellowship program since the inception of the subspecialty. 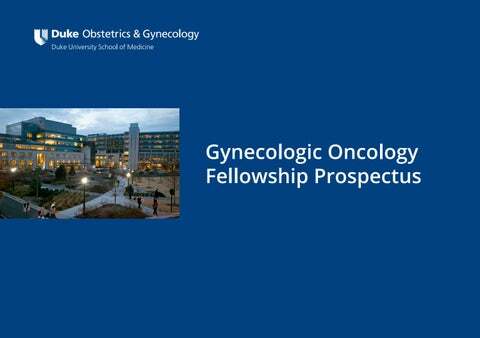 Over the past almost 50 years, members of Dukeâ&#x20AC;&#x2122;s Division of Gynecologic Oncology and graduates of our fellowship program have been instrumental in advancing the field. Today, the division has 7 gynecologic oncology faculty, 1 clinical cancer geneticist, 3 fellows, and 6 physician assistant/nurse practitioner extenders. There are 3 radiation oncologists devoted to treating women with gynecologic cancers. Our division is also the focal point for genetic testing and management of hereditary gynecologic cancers. We are leading contributors nationally to cooperative group and industry clinical trials. Duke is a world-class tertiary referral center that provides innovative high-quality care to women in our local community, across the Southeast and US, as well as globally. The breadth and depth of experience you will receive at Duke will prepare you for success as an academic gynecologic oncologist. At Duke, we have a tradition of training outstanding gynecologic oncologists who have become leaders in our field. Our goal is to do the same for you! Each fellow is in the OR 3 days a week at Duke North. Extensive training is provided in adbominal, laparoscopic, and robotic surgery. Majority of research training occurs during the first year. Clinical projects are often completed during the clinical years. All gynecologic oncology faculty participate in research and actively mentors fellows. Fellows lead the care of the inpatient service with attending supervision. Extensive resources through Duke University allow for effective projects and rewarding collaborations. Fellows participate in educational activities as they lead a team of residents and medical students. Research support staff are available. Off service rotations includes radiation oncology, and the senior fellow has the option of spending one month on the GI or GU service at Duke. 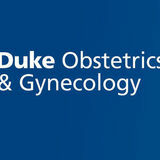 Clinics take place at the Duke Cancer Center and Duke Women’s Cancer Center of Raleigh. Fellows only attend clinic at Duke Cancer Center and each fellow is in clinic 2 days a week. During a typical clinic day, new consults, chemotherapy, and return patients are seen by attendings, fellows, residents, advance practice practitioners, and nurses who work as a team. Survivorship clinic is available for our patients in surveillance. GLOBAL HEALTH OPPORTUNITIES Dr. Lee is developing a gyn oncology fellowship training program in Uganda with national and global collaborators. These efforts supported by Duke Gyn Oncology, Duke OBGYN, and Duke Global Health Institute will improve access and treatment for women with gynecologic malignancies in Uganda. Fellows may have the opportunity to spend a portion of their elective time during their third year with Dr. Lee. WHAT TO EXPECT ON INTERVIEW DAY We offer 2 interview dates, interviewing approximately 12 candidates each day. Each applicant will have the opportunity to interact with our faculty and fellows, tour the medical campus, and participate in a group activity. We begin with a social dinner event the evening prior to the interview day. The day of the interview begins at 7am and concludes by midafternoon. GETTING TO KNOW DUKE HEALTH Duke Health conceptually integrates the Duke University Health System corporate.dukehealth.org, the Duke University School of Medicine medschool. duke.edu, and the Duke University School of Nursing nursing.duke.edu. It is the combination of research, clinical care, and education that takes place through the efforts of our faculty, staff, students, and trainees at many different sites throughout our region and worldwide. DURHAM AND RTP Durham is at the apex of North Carolina’s famed Research Triangle rtp.org, an area formed by Duke University, North Carolina State University in Raleigh (20 miles from Duke), and the University of North Carolina at Chapel Hill (11 miles from Duke). Durham is also close to the coast and the mountains. Research Triangle Park - Inspiring Bold Ideas We believe that those who have the freedom and support to pursue bold ideas will change the course of history. We foster that potential by investing in the fabric of our community. Durham is well known from the movie Bull Durham, which featured our popular minor league baseball team, the Durham Bulls — a Class AAA farm club for the Tampa Bay Rays. The hot dogs always taste better at the ballpark, and rooting for the Bulls in the Durham Bulls Athletic Park is among the joys of summer. The term “bull pen” was coined by a sportswriter to describe the area where relief pitchers warm up, because their activity was overseen by a snorting, locomotive-size bull on a Bull Durham Tobacco billboard. Durham has become a national trendsetter for its food scene. Durham was recently ranked as The South’s Tastiest Town by Southern Living and America’s Foodiest Small Town by Bon Appétit. Gourmet Magazine, the New York Times, and other publications have written about Durham’s locally produced food, traditional Southern cooking, and food trucks.